The RipStik caster board is like surfing or snowboarding on dry land. The RipStik’s 360-degree, inclined casters and pivoting deck move the rider forward with a unique twisting motion – without ever pushing off the ground! 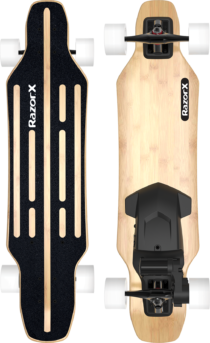 Twist and go… There’s nothing quite like the feeling of riding a Razor RipStik casterboard. It’s like carving through waves or snow – but on dry land. A pivoting deck and innovative 360-degree casters are the secret behind the craze. Rip it! It takes practice!Once you get the hang of this you never want to stop! so fun! and the colors are great!! !